Join us for the kickoff for the new Sunday School year on Sunday, September 9! We will be gathering after worship to get an overview about our upcoming Sunday School Curriculum. Following the Sunday School introduction, members will be participating in service projects for the 2018 God’s Work, Our Hands Sunday. We will be collecting items for the Culpeper Food Closet and delivering gift baskets to our shut-in members. Please join us for this special day of Christian Education and service! A few wonderful pictures from a great week. The theme was “Go Tell it on the Mountain!” where we were joined by 75+ kids and 30+ volunteers for 5 days of learning God’s promises. All families are invited to participate in the Stations of the Cross for children this Friday, March 29, 2013, at 5pm at Yowell Meadow Park. This unique time of worship will be led by Father Bill Eberle of Little Fork Episcopal Church. Pastor Kate will be in the main parking lot a bit early if you’d like to walk together. The walk will begin from there. This meaningful service includes Jesus and a narrator speaking with the children and explains the crucifixion in an age appropriate way. If you have questions, please contact Pastor Kate Costa- 825-8358 or pastorkatecosta (at) gmail (dot) com. Hope to see you there! On Sunday December 16th, St. Luke’s children gave their performance of “It wouldn’t be Christmas without…” Following their show and the worship service we all gathered around for hot cocoa, cookies and good fellowship. Our Rally Day was held on September 9, 2012. We had a wonderful potluck breakfast, activities for all, and great fellowship. Check out the pictures from Rally Day and the first day of Sunday School! 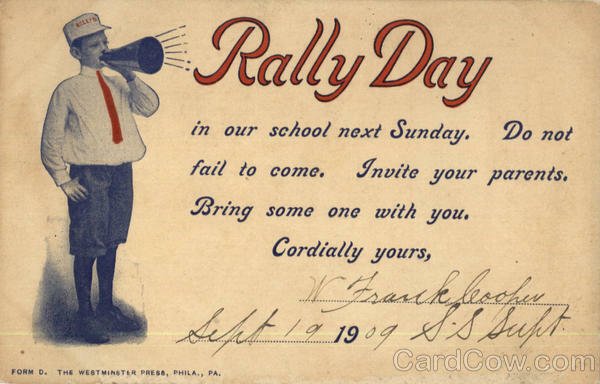 Join us this week for Sunday School Rally Day! We’ll begin with breakfast, Sunday School registration and fun at 9am- then worship at 10am.